Vital Transformations Mauri Ora consists of three exhibitions, a series of music performances and a hui-symposium. It is a partnership project with Te Matahiapo and was commissioned by NPDC as part of CBD Revitalisation. It is supported by WITT. Part of the project involves visually changing the inner city landscape of Nga Motu New Plymouth, which features artist designed vinyl graphics in shop windows and colourful banners hanging from lamposts. The exhibition Unrealism will take place in a currently unused shop on the corner of Devon and Liardet streets, downtown Nga Motu New Plymouth. It features work by seven Taranaki artists whose work touches on the idea that reality is a window into other realms. At Koru on Devon Gallery, the exhibition Vital Transformations (also the name of the overall project) includes works by another seven artists who all have a strong connection to the environment. This connection is sometimes intuitive, and at other times involves materials used such as harakeke. Re-using and upcycling materials is also a theme to some of the works. The third exhibition Art-science+environment includes a diverse range of works. A theme of wai or water runs through the exhibition, which consists of work by tangata whenua and artists who explore nature and the environment. The exhibition is at JD Reid Gallery, and includes some art works that directly explore climate change and global warming, and are based on scientific knowledge. Pointing to a new relationship needed with the environment, images by local environmental consultancy Greenbridge will also be displayed. Opening on July 6th at 4.30, the exhibitions run until July 29th. Each weekend, there will be a music performance and on Saturday July 28th 10am-1pm at JD Reid Gallery, the hui will take place. Astrophysicist Roger Malina, artist-scientist Nina Czegledy, Italian Professor and Noema Lab Director Piere Luigi Capucci and colleague Roberta Buiani will present online, alongside those at the gallery – Maata Wharehoka, Dr Jane Richardson a geologist at Massey University and Daniel Woolley of Greenbridge. An important part of the overall project is to bring together generations, culture and knowledge where these overlap with a concern for the environment. We live in a world where the boundaries of knowledge are changing to be interdisciplinary, intercultural and intergenerational. Vital Transformations Mauri Ora embraces and supports this view, as part of the commitment of Intercreate to resolving environmental issues. All exhibitions are open Wednesday to Sunday 10am to 2.30pm. Art-science+environment at JD Reid Gallery. Featuring Wharehoka Smith, Janine Randerson, Julian Priest, Leeann Rapira, Haoro Hond, Hugh Cargill, Anna Korver and Greenbridge. The show incorporates video with work by Sharmila Samant (featuring several locals including Dr Te Huirangi Waikerepuru), Tracey Benson, Jo Tito, Inahaa Te Urutahi Waikerepuru, Stacey Aglok Macdonald, Ingrid van Amsterdam, Josephine Starrs and Leon Cemielewski, and Angela Lyon with Aroha Novak and Charlotte Parallel. 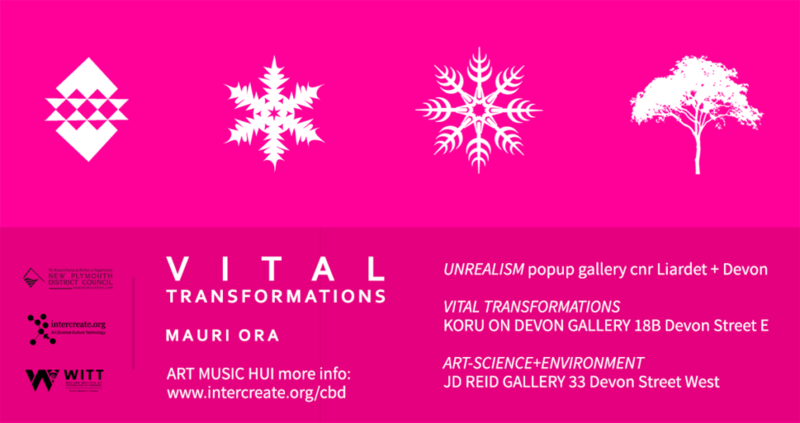 The exhibition Vital Transformations at Koru on Devon Gallery. Featuring Wayne Morris, Dale Copeland, Mi Sun Kim, Carl Fairweather, Sally Hikaka, Howard Tuffery and Jo Tito. Unrealism in the popup gallery at the corner of Devon and Liardet Streets. Featuring Joshua Sands, Connor Smith, Dwayne Duthie, Tracy Amstad, Tyler Allan, Leeann Rapira and Laurel Davis. Warrior Mountains video by Inahaa Te Urutahi Waikerepuru. Concluding with reflections on the day and events.